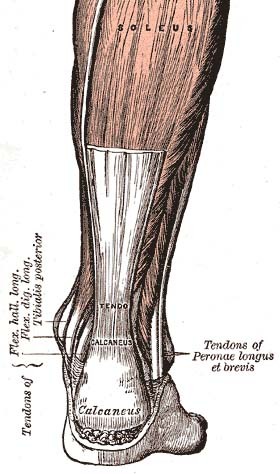 Image via WikipediaDid you know that your Achilles tendon is the biggest tendon you have in your body? Did you know that it can take a force of one thousand pounds of pressure? Or did you know that it is also the most common tendon to rupture? When an Achilles tendon is inflamed, causing pain, it is called Achilles Tendonitis. The Achilles tendons is located on the back of your legs, connecting the calf muscle to your heel bone. This tendon has forces placed upon it every time you walk, run, stand up, climb stairs, basically any time your leg moves. So it is obviously an important tendon that you don’t ever want to have injured. The problem is that it is usually one of the most common places to get an injury, just because so much force is place on it. You know if you have Achilles tendonitis because it usually begins with a mild pain after extreme amounts of work like exercising. That pain then continues to get worse. Other things to watch out for are pain located along the tendon after a couple hours of exercising, swelling in your leg, pain or tenderness in the morning an inch and a half above your heel, or if your leg is more fatigued then normal. To treat Achilles tendonitis, apply the RICE treatment (Rest, Ice, Compression and Elevation). You can also take anti-inflammatory medication to help, along with the ice, to reduce swelling and pain. Make sure you stretch before and after exercising to insure that this tendon is warm and cooled down so that the tendon will not be pushed to the extreme before it is ready. Even if you are just a weekend warrior, make sure you stretch before working on your house! If you have any questions regarding Achilles tendonitis or any other sports related injuries, please contact Dr. Adam Teichman at East Penn Foot & Ankle Associates. Thanks for linking to my blog. Love the image. I’ve learned to treat my Achilles Tendon a little better.